A picture from allrightin miitti in Vantaa from 2013. 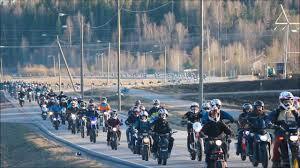 In Vantaa you can see more people riding Motorcycles and Mopeds than you do in Helsinki. Why is that? And what is the culture behind it? We interviewed an active “rider” to get to the root of this! He won’t reveal his true identity but goes by the name okke. Here’s our Q&A with him! We: What is the culture really and what do you have to do to be a part of it? Okke: Well there is really no terms to join the culture. The culture is all about having a bike and driving fast. No more needed. We: Why is it so popular in Vantaa? Okke: It’s a way of transport simply. You can get a moped when you’re 15 and a lightweight motorcycle when you’re 16 and you get from place A to place B much faster than with bus. Why it is in Vantaa is simple, more straight roads and less traffic than in Helsinki for example. There i can ride like 100 meters and then i have to slow down again. But in Vantaa I can drive fast, pull wheelies and overall just play around with them. We: Are there any local MC gangs? Okke: Well not any big ones, the big ones are national. The only one i can think of is MC Päiväkumpu with around 100 members. We: What does riding mean to you? Okke: For me personally I have ridden ever since I was little with any kind of motor vehicle I could get my hands on. The speed, sound of the motor and smell of the exhaust gases fascinates me! I feel freedom when i ride and can let go of all my worries. And after all, it’s freaking fun! We also asked people who don’t own any kind of bike what do they think of the culture. There were some mixed opinions. For example Ode thinks that it doesn’t make any sense and people who belong to it don’t do anything else with their lives than drive. But then again Leon says that it is nice way to spend time for the kids but really isn’t bothered about it. The culture also includes pulling tricks like wheelies, donuts etc. In minds of many, this is hazardous and unthoughtful. But the riders really needs their adrenaline kick!